beautifully Artistic Vintage Geometric Israeli Yaacov Agam Bauhaus Rug, Country of Origin / Rug Type: Israeli Rug, Circa Date: Mid – 20th Century – This brilliant art rug is a stunning example of the mid century modern art of Israeli Bauhaus artist Yaacov Agam. 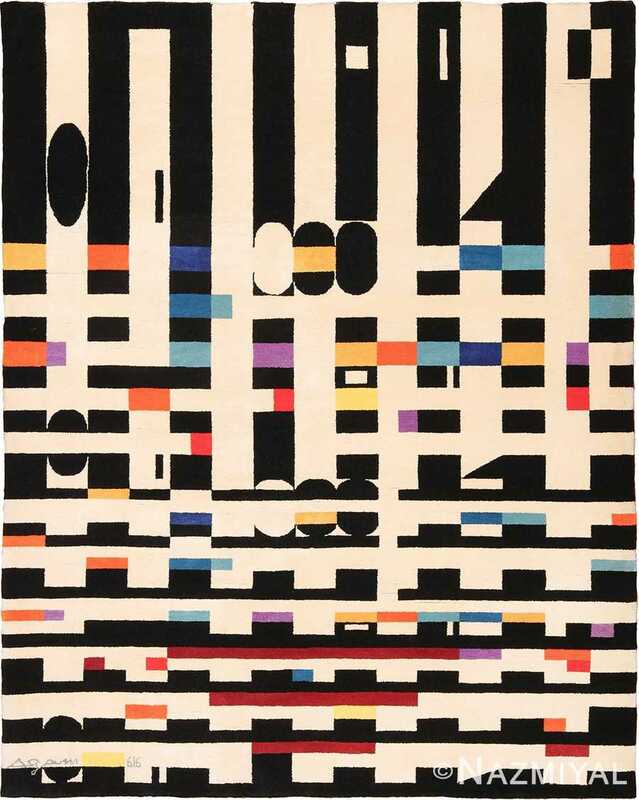 The Bauhaus school and subsequent artistic movement defined abstract art from 1919 to 1933. Agam is known for his dynamic us of light, form, and color to create a sense of movement and hidden meanings in his works. 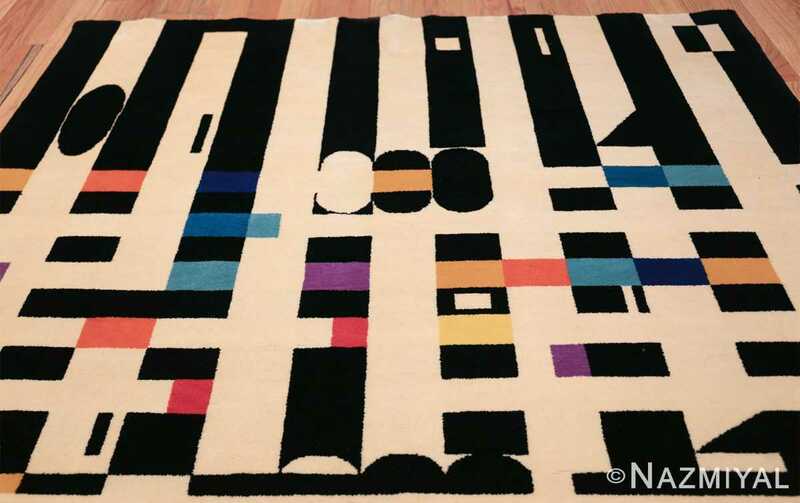 This magnificent limited edition Tapestry rug is an excellent example of his work and uses both form and color to create horizontal and vertical movement. 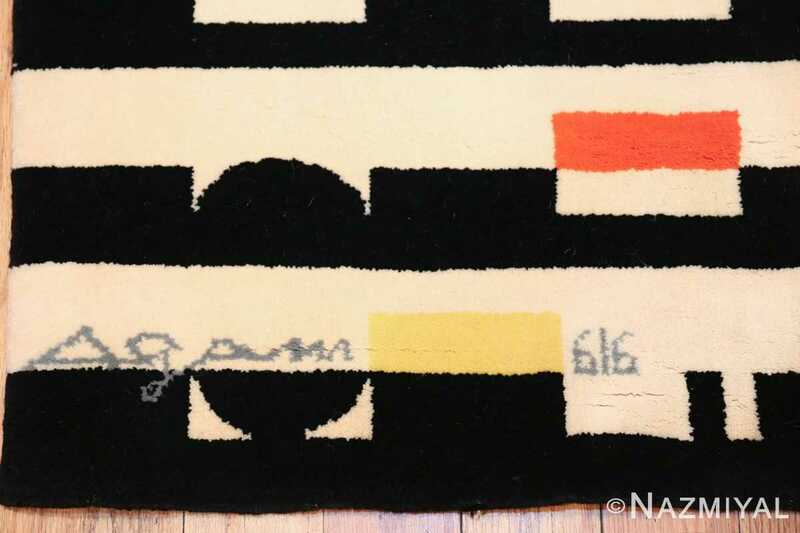 Black and white geometric designs form both the background and the theme of this impressive vintage mid century rug. As the eye moves along the horizontal and vertical planes, it encounters shapes of black, white, reds, blues, purples, oranges and yellows. The entire rug is based on high contrast colors and combining simple geometric shapes. 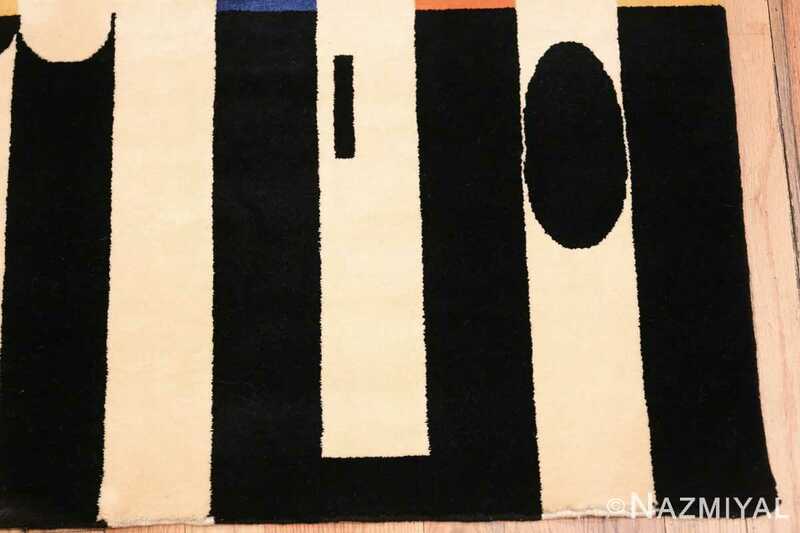 The end result is this magnificent art rug that creates fascinating juxtapositions and is a source of never ending interest. 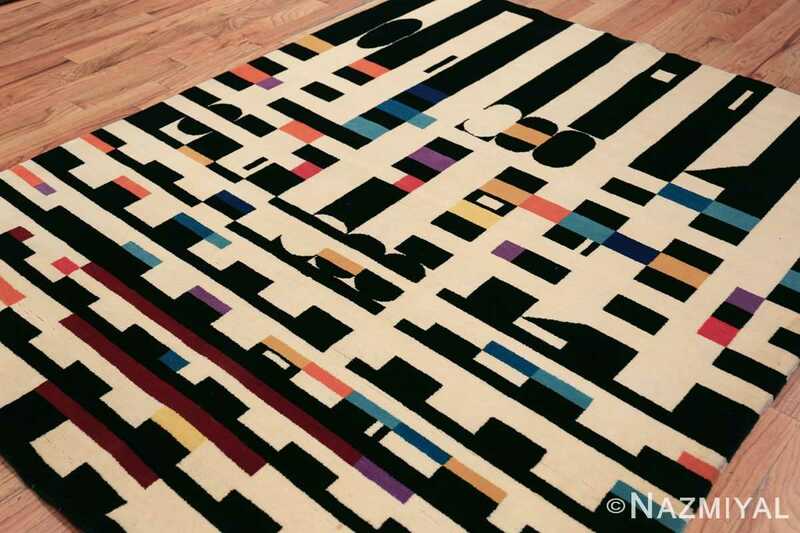 The lines of this Yaacov Agam Bauhaus rug are closer at the bottom. As one ‘s gaze moves up, the horizontal lines eventually become less distinct, and at some point they disappear completely and are replaced by vertical lines instead. 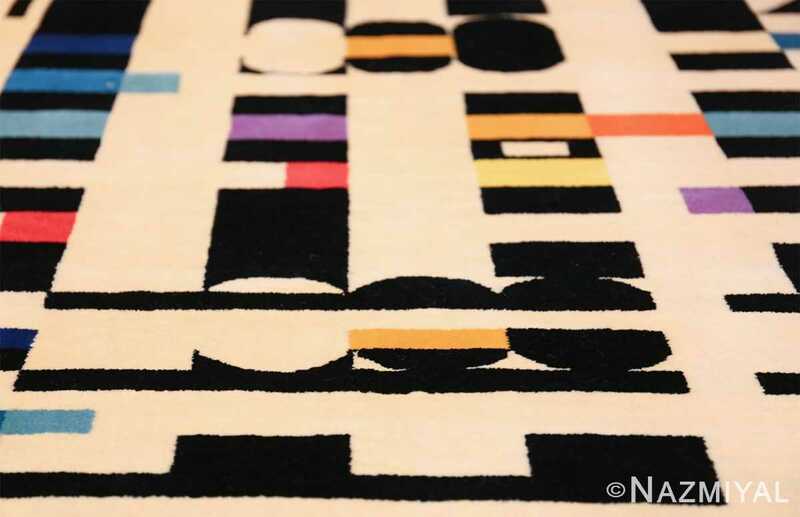 This creates a distinct sense of vertical motion, with the design becoming more condensed as it nears the bottom. As the vertical lines disappear, the other brightly colored geometric shapes become bolder and far more pronounced. Eventually, as we move towards the top of the rug, these colorful shapes also disappear. 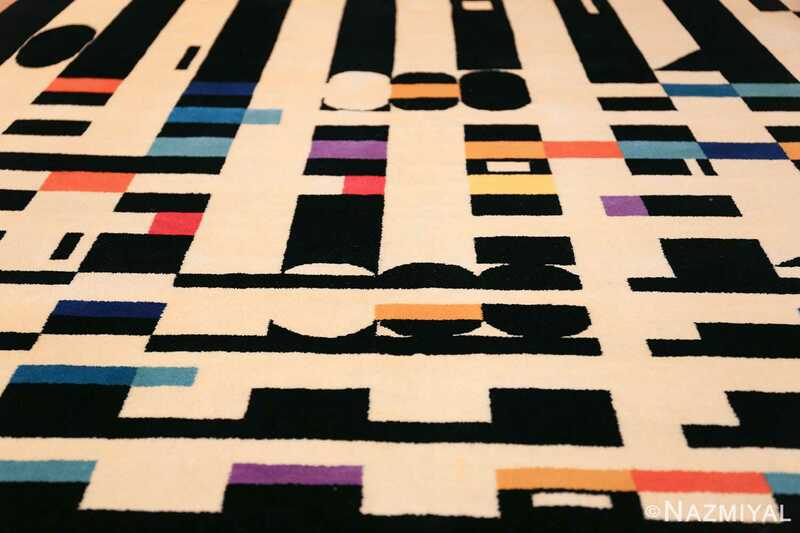 The eventual dissolution of the design elements towards the top the rug creates a sense of evolution as the eye moves from the bottom to the top of the rug. It creates a sense of weight on the bottom of the rug, evoking an emotional response from the viewer. With each turn, the eye finds something completely unexpected. 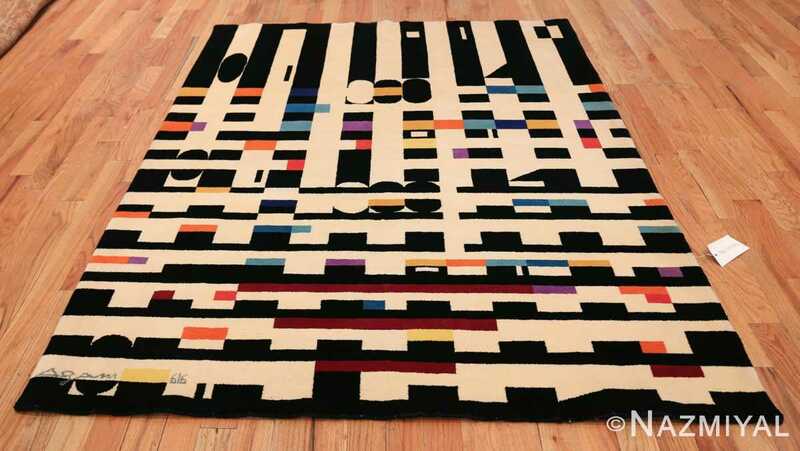 This Israeli Yaacov Agam Bauhaus rug in one that any collector would love to have in their mid century or even modern art collection. The Bauhaus school would go on to influence art movements from the most famous mid century designers to Post Modern artists. 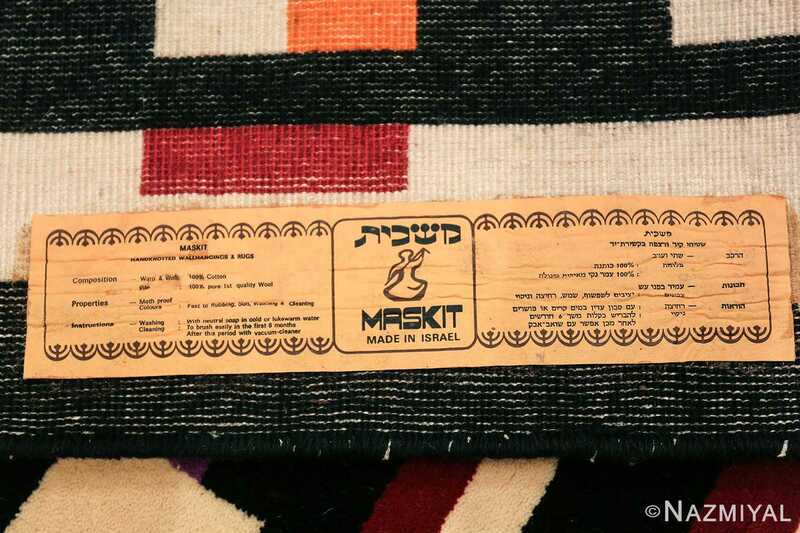 This is an influential piece by an influential Israeli artist. 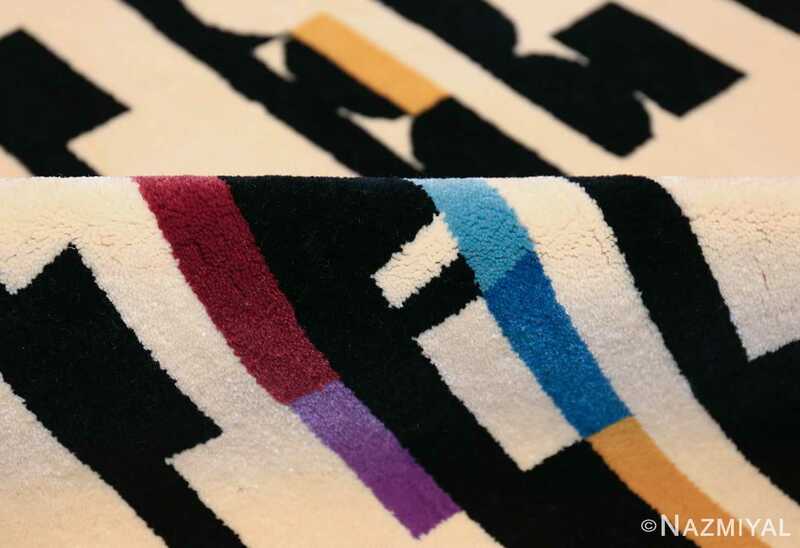 It makes a bold statement and will be the focal point of any interior design.